Deborah made a series of machine-embroidered maps of Belfast whilst studying Architecture, which now form part of the Ulster Museum’s permanent collection. This prestige prompted Deborah to set up her own textile business. 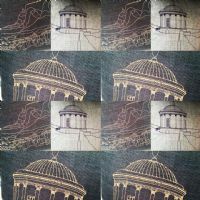 Using locally sourced Irish linen, her creation of cushions, lavender bags, doorstops, and framed pieces are embroidered with signature architectural images, maps and skylines, depicting many famous or local landmarks.